Looking for a new way to travel that is fun and exciting? Ever wanted to get away to do something quite and relaxing....Sail The British Virgin Islands. Start your trip by sailing the channel Sir Francis Drake. Sail the channel enclosed between the green, lucious islands on your own 50-foot sailboat, complete with a captain and a steward. The Moorings offers crewed or uncrewed yachts worldwide. Contact them at phone number (800) 535-7289 or visit them on the web at www.moorings.com. Sail past St. John with it's high and green mountains, then pass St.Thomas with it's low and purple rolling hills, or travel a 100 miles out to St.Martin where you might just be able to catch some flying fish. 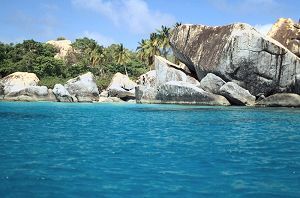 Visit the second largest island VIRGIN GORDA. Circle a sandbar and anchor to find a secluded beach or cove or go inshore to visit The Baths for snorkeling. The Baths are known for it's granite boulders and tropical fish. Then visit the island ANEGADA, the only coral island. Follow a silver-white sand road passing the Flamango pond to a turnoff at Cow Wreck Beach where you can enjoy the main crop of the island, lobster at the Cow Wreck Beach Bar and Grill. Next, make a trip to TORTOLA. All the roads of the island led to Road Town which is the seat of the government as well as the metropolitan center for the Islands. Ask for Josh's Bakery and try a cheese roll for 2 bucks, the best lunch for it's price.